« Deja Vuesday: Lay it away? Open back shelving, a few luxe pieces of clothing and a lot of neatly-wrapped gift boxes. 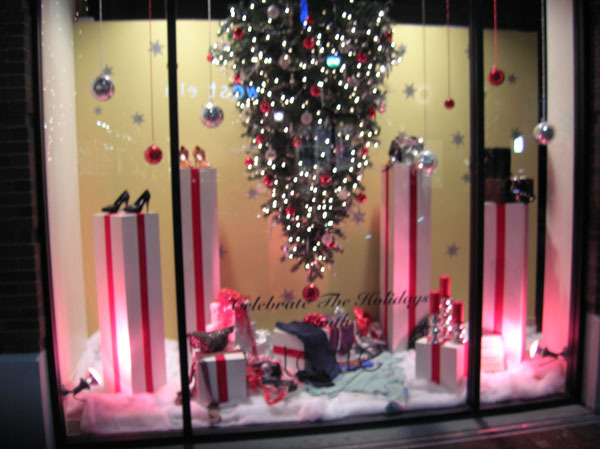 Add bare branches and red berry garland, and you have an exclusive, boutique look for your holiday windows. Bonus: takes 3 minutes to switch out merchandise! Turn their concept of gift-giving upside down! 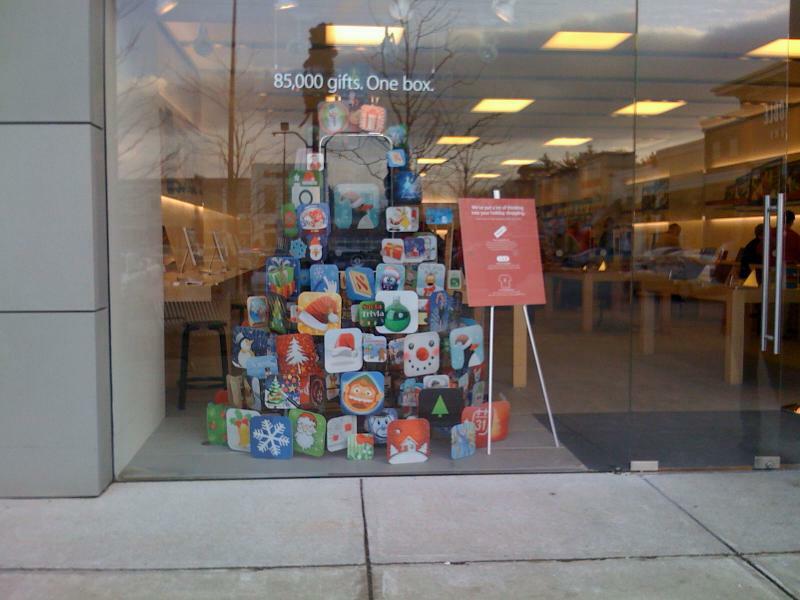 Anything can be featured on those gift-wrapped pedestals. A word-of-mouth -worthy display! Those snow blankets? They say a lot in your window or on an interior display…and take up no space! You might prefer white (or silver?) 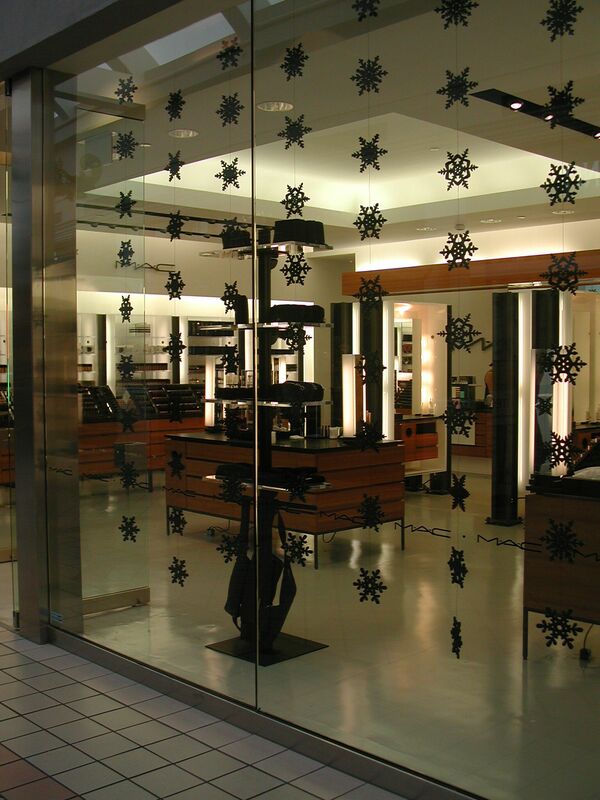 snowflakes, but here’s a window that costs less than $5, takes up no space, and (yay!) you can leave up ’til Valentine’s Day if you need to! Bonus: A child could do it. Your child perhaps? We just opened in August so this is our first Christmas season. I did buys decorations at garage sales this summer as you suggested Kate, but our biggest items came from a consignor who is moving and asked if I wanted to look buy her decorations. She was a professional tree decorator!!!! Needless to say we now have two beautiful trees fully decorated ( yes one in the window in all it’s lights and glory) and one by our dressing rooms and fireplace. The customers love ittttttt!! Jenni, you are SO right about the lights. I was driving around town the other night and NONE of the consignment/resale shops had a SINGLE light in their windows…not even the ones next to a restaurant, cafe, etc. And we’re not talkin’ at midnight…more like 7-9pm. How dumb is THAT? The shops were totally invisible. I love them all – the last one especially because it takes up NO space at all. Like a lot of shops, we never seem to have extra room so I like the idea of either window painting or something flat that you can still see through, not too busy. Don’t forget the lights. Just one well placed strand of icicle lights or a shining star can draw lots of looks if you leave it on overnight.